It’s important to keep your immune system in tip-top shape at any age. And as flu season reaches a peak, it’s even more critical to keep your body healthy and strong and ready to ward off seasonal bugs. There are several strategies you can employ to strengthen your immune system. For example, get plenty of sleep, reduce stress and take some time outdoors to increase vitamin D levels. Consuming certain foods may also be beneficial - here are some immune boosting foods to consider incorporating into your diet. 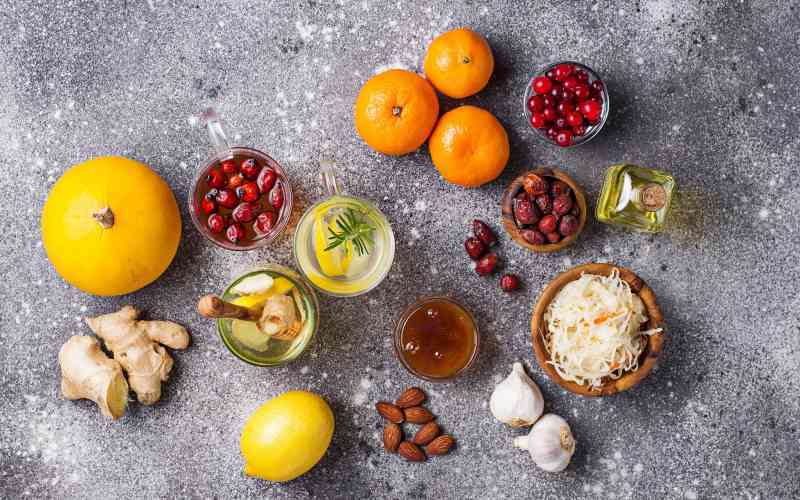 These citrus superfoods along with others such as tangerines and grapefruits pack a powerful punch of vitamin C which can help build immunity against colds and other viruses. Unlike some other nutrients, the body doesn't produce vitamin C on its own, so it’s important to supplement it in some way like eating citrus fruits. Vitamin C helps create new white blood cells and provides the body with antioxidants to help fight toxins, making it a key immune-fighting element. With an illness it’s not uncommon for blood pressure to increase, and this can create additional health concerns. Garlic is a delicious addition to many dishes, and can also help lower blood pressure. Garlic is also thought to reduce inflammation and help pain levels thanks to a chemical it produces called Allicin. These dark-colored berries produce powerful antioxidants that have been shown in some studies to have antiviral properties. Mix these delicious berries into a smoothie with yogurt (yogurt boasts its own immune-fighting powers) or sprinkle them on granola or oatmeal for a boost to your system. This sweet treat contains calcium, magnesium and iron and has significant antibacterial properties. Honey can be useful for helping to flush toxins and free radicals from the body. It’s also an old-fashioned remedy for reducing nasal drainage and congestion, helping to alleviate coughing and soothing sore throats. Your mom was on to something when she gave you chicken soup for a cold. Poultry, such as chicken and turkey, is high in zinc which boosts the production of disease-fighting white blood cells. This superfood is high in iron and rich in vitamin C, beta carotene and other antioxidants that can help drive illnesses away. Cooked spinach has good nutritional value, but for the highest concentration of vitamins try to consume your spinach raw. Salads and smoothies are both delicious options for raw spinach. Consuming a variety of nutritious foods is key for overall health and well being. Daylesford Crossing’s Dining Director, Shane McGee, draws upon his culinary training in Europe and past experiences as a chef of his own restaurant to develop delicious and nutritious fine dining options for our residents. Schedule a tour today to learn more about our community.